Women are bigger wimps than men when it comes to pain, research suggests, contrary to the popular notion that the reverse is true. 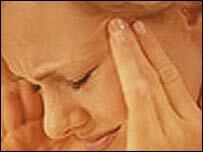 Not only do they feel pain more easily, women are less able to cope with it, believe scientists at Bath University. Women focus on the emotional aspects of their pain, which makes it worse, while men tend to focus on the physicality. Their findings are based on a series of pain tests on 50 men and women using triggers such as ice cold water. Volunteers were asked to put their arm in a warm water bath for two minutes before plunging the same arm into a vat of icy water for a further two minutes or until they could stand the pain no longer. The women felt pain much sooner than the men and were able to endure it for far less time. Furthermore, when men were asked to think about the sensory aspects of the pain rather than the emotions related to it, the pain decreased. This strategy did nothing to help the women. Lead researcher Dr Ed Keogh, a psychologist at the Pain Management Unit at the university, said: "Our research has shown that whilst the sensory-focused strategies used by men helped increase their pain threshold and tolerance of pain, it was unlikely to have any benefit for women. "Women who concentrate on the emotional aspects of their pain may actually experience more pain as a result, possibly because the emotions associated with pain are negative." He told the journal Pain how mounting evidence suggested that "women experience a greater number of pain episodes across their lifespan than men, in more bodily areas and with greater frequency." Dr Beverly Collette, from the British Pain Society, said: "This supports previous experimental work. "Women tend to report to pain at lower thresholds than men. We know that we have far more women attending pain clinics than men too. "But it's a very complex area." She said there were many theories to explain the gender difference. One is that women have an innate caring role and that they are therefore more attuned to recognising pain in themselves as a warning sign in case it is something dangerous that would impair their ability to care for others. Another theory is that it is down to hormonal differences. "More research needs to be done. It's hugely important because most of the drugs we use in pain have been tested on men. There is some evidence that women respond better to different pain killers than men."